I'm on the road in the South and what better time to try something different. I'm passing through Atlanta, GA and its sprawling metropolis. Getting around this town can be a challenge, no matter what your mode of transportation. Thus, when new things pop-up near where a person lives folks are willing to give it a try, because who wants to drive across town in rush hour traffic. Fortunately while I was there, a new donut place opened within a 5 minutes drive from where I was staying and hitting them up before getting on the highway seemed like the perfect opportunity. 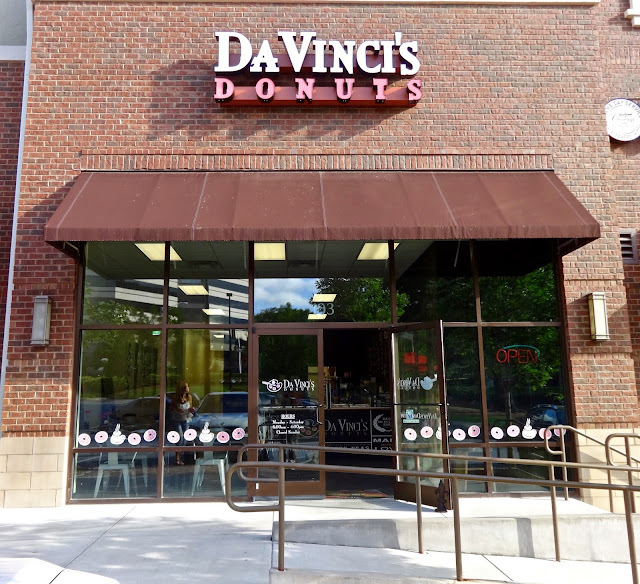 It was called Da Vinci's Donuts and like most things in this town in was located in sort of an office building/strip mall complex. This is not your typical donut shop. The schtick here is it is like a build your own donut kind of place. The base donut is a mini-sized cake style donut. They have about 20 pre-made varieties and/or you could get it topped with a selection of toppings. Kind of like one of those yogurt places where you get the base and then add whatever toppings you want. Not really wanting to go through all that I just decided to go with their Da Vinci dozen--16 donuts of my choice for $15.25. 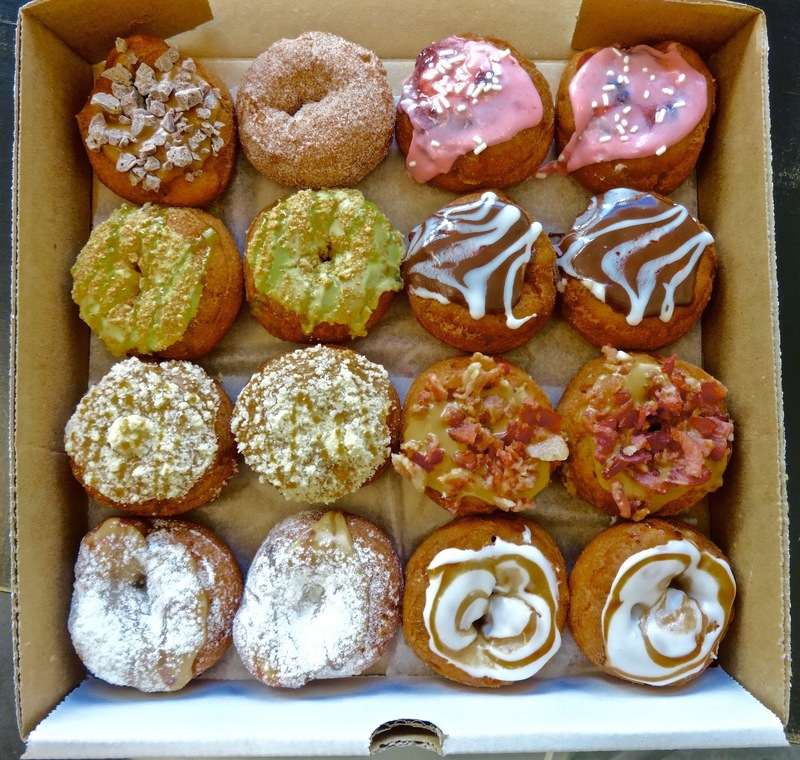 In order of appearance from the top left down we have caramel crunch, cinnamon sugar, strawberry cream, key lime, chocolate cream, salted caramel, maple bacon, french toast and cinnamon roll. Let's just get this out of the way now with no judgement--yes, I tried at least one of every one, so, whatever. They are mini's at least. As I stated above, the base donut is the same. It's a cake like version very similar to an old-fashioned. It's kind of light inside a crunch on the crust--that's the joys of deep frying. With this in mind, it puts lots of pressure on the toppings to really make these different or stand out. For me, most of the glazes all tasted close to the same. Some version of sugar with slight flavor modification. The caramel crunch does add some extra texture, though the caramel doesn't have that real punch of caramel flavor. The strawberry does give a bit of burst of fruity flavor as there is strawberry flavor in the icing and like a dollop of strawberry jam underneath. The maple bacon is the one that does stand. While the bacon could have been a bit crispier, it still have a nice salty smokey flavor and there was distinct maple flavor in the icing. Mixed with the cake donut it was almost like having a pancake breakfast. It does stand out as a specific donut flavor profile. No surprise that this one is their most popular. As a concept, Da Vinci's is interesting, and as a something for kids and what not, it can be fun to build your own donut. Plus they are mini's so you don't have to feel (too) guilty if you only get one or two. Plus the basic cake base is decent enough. Just for me, a little samey after a bit even with the different toppings. I kind of was hoping for a cream filled or something but that's not this place. If you are in Atlanta and are looking for something kind of fun and funky to run by and check out, Da Vinci's is quirky enough. After awhile though, I think the sameness would wear a little if you lived in the hood. Though, considering the traffic in this town you'd have to go through to get around, you might look past it.